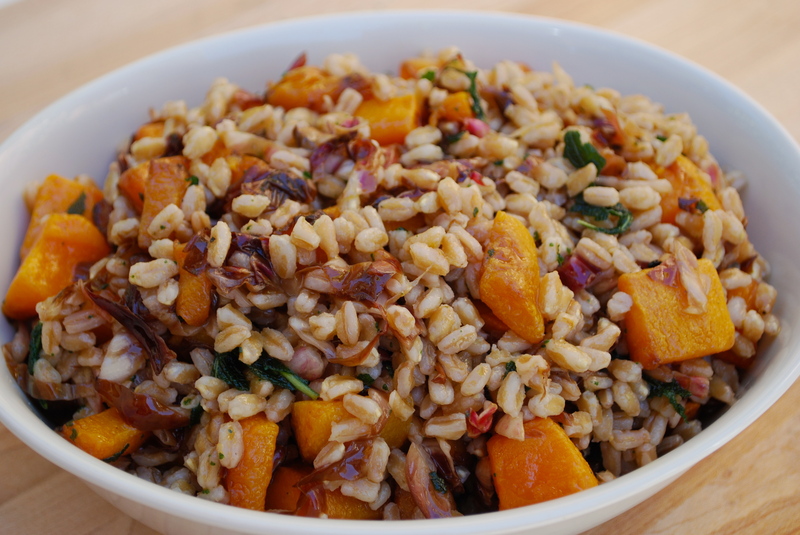 Farro Salad with Roasted Squash, Radicchio & Sage | Time to Cook! Recipe from blog Savory Pear in the November 2012 Newsletter. Pre-heat the oven to 425 degrees. Peel, seed, and cut the squash or pumpkin into 1/3 inch cubes. Toss with 1/2 cup olive oil, pinch of salt and pepper. Spread into a single layer on a rimmed baking sheet. Roast for 20-30 minutes until a toothpick inserts easily and the squash or pumpkin is nicely browned. Let cool. Place the farro in a large pot of lightly salted water. Bring to a boil, lower the heat, and simmer until the grains are tender, 15-20 minutes. While the farro is cooking, combine the vinegar, 1/2 teaspoon salt and some fresh ground pepper in a small bowl and slowly whisk in 1/2 cup olive oil. Drain the farro and add to a medium or large bowl. Toss in the vinaigrette (you might not need to use it all) and add radicchio, tossing well and allowing it to wilt slightly. Heat 1 cup vegetable oil in a saucepan to 350 degrees. Add 5-6 sage leaves at a time and fry until crispy, 20-30 seconds. Remove and drain on paper towels. Repeat with remaining sage. Just before serving, toss in the roasted pumpkin, crumbled fried sage, and season to taste with salt and pepper. Serve warm or at room temperature.